We have been using cloth diapers for awhile now and it’s going pretty well. I can’t believe how much there is to know. I’ve bought around 5 or 6 different brands and also made several different kinds myself. It feels really good to be saving so much money every month now that we are up and running. Of course the up front cost is seemingly quite a lot but in the end, if you make the commitment to using them long term, you end up saving a ton. 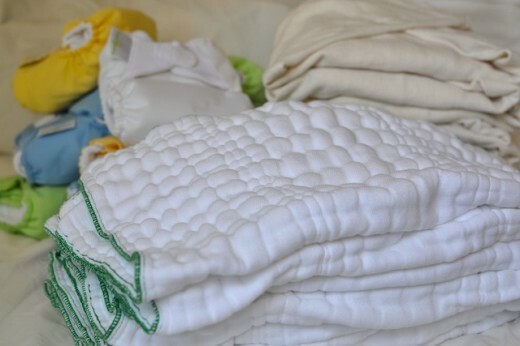 Here are a couple ways I found to make cloth diapering less expensive. If you are going to buy diapers, consider using diaper covers and pre-folds. They are super absorbent and cheaper to buy. Pre-folds come in many options as far as fabric, so you’ll have lot’s of choices to fit your preference. Bamboo, Hemp, Cotton, ect. And if you’re going to do it, DO IT! 🙂 Try to buy disposables as little as possible and stick with it even through potty training. I will say that the time they require is noteworthy. I honestly wouldn’t do cloth diapers if I were working full time. It has helped that my husband has been supportive and excited for us to make this change. Learning the ins and outs, the extra laundry, troubleshooting, sewing dipes and supplies, and diapers needing to be changed more often- can be time consuming. It’s very important to switch to detergent free of blockers. We have been using Rockin Green but you can also use Amway’s detergent or EcoSprout. Detergent, softners, ect can leave residue in your washing machine so it’s important to switch entirely over to a safe detergent. Otherwise your diapers will become less and less absorbent. Let me know if you would like me to write bout anything specific about our cloth diapering experience! Check out Seams Geeky on Etsy! Lots of new and exciting listings at Annithreadz! Check us out on Etsy!
. . . only the beginning. . .
And this is only the beginning of a beautiful relationship. I LOVE FABRIC.